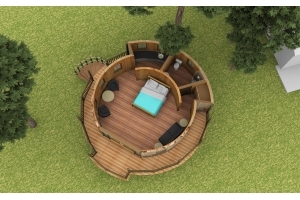 Planning Permission has been granted for two eco-lodge tree houses at Fair Oak Farm, East Sussex. The project will enable the re-introduction of farming to the agricultural land at Fair Oak Farm whilst benefitting the local economy, in particular by providing more jobs and much needed support to Mayfield village shops. 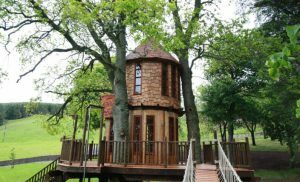 Each eco-lodge tree house will provide luxury self-catering accommodation for grown-ups that want to fulfil their innermost childish dreams. Clad with sustainable timber and fully insulated, they will contain a double bedroom, en-suite wet room, seating and dining areas, fully equipped kitchenette and sheltered balcony. Set in mature trees the eco-lodge tree-houses will provide complete privacy with uninterrupted valley views of stunning Sussex countryside. Each lodge will sleep two people, offering them all the usual mod cons that guests at Fair Oak Farm have come to expect from the 4-star quality graded holiday accommodation. Facilities will include heating, hot water, LCD TV, fresh white linen and towels, wireless broadband and DVD library.